So I don't have many pictures at the moment because the good ones are on Rich's phone and I can't find his cable, so, helpful. Even so though, we didn't take many anyway as we are forgetful and get too busy having fun. It happens every holiday. 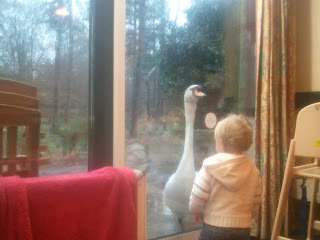 The swan up there - lethal. 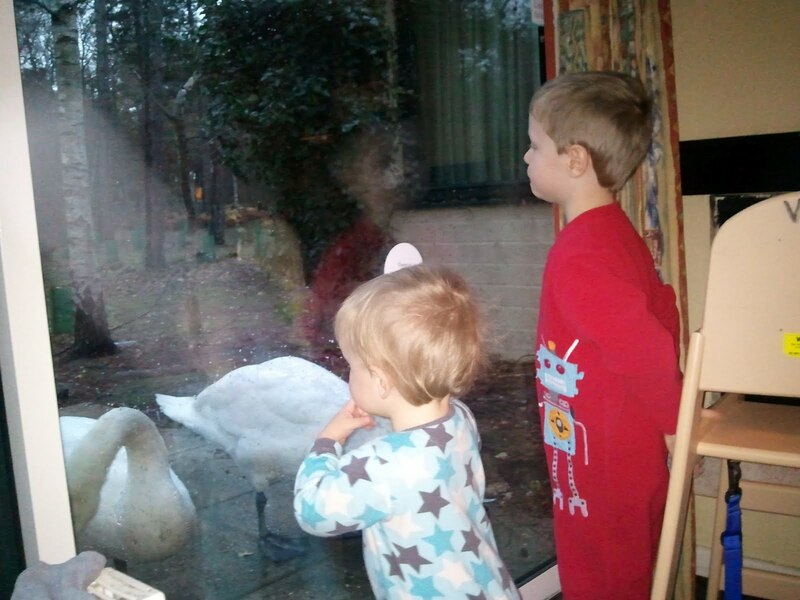 That was our little patio, every morning we were greeted pre-dawn by squirrels, ducks of many varieties, pidgeons, the occasional seagull and these 2 monstrous swans. They were fine for a couple of days, but on day 3, one of them saw me coming with the food, and started PECKING THE GLASS. It was also pressing it's body up against it. There was no way I was opening that door. It was not giving up. I had to go around to the bedroom window and lure it away while Rich opened the door and threw out the food as quickly as he could. The squirrels too were fearless, we had a few mad scrambles to shut the door before one got in with those too. Sam and Ethan loved it though, and spent ages each morning watching them. After that it was swimming each day. On day one Sam cried the entire time. Rich and I kept throwing each other what-have-we-done? glances, as we'd bigged up the swimming everyday to Ethan, and so couldn't really back out! The next day we let Sam nap first, fed them and then went and he decided he loved it, phew! On the Tuesday evening we took the boys to 'Animal Magic' and animal show and tell sort of situation, with all your fluffies, rabbits, baby chicks, a couple of cute rats. Then they brought out the hissing cockroaches. Bleurgh. 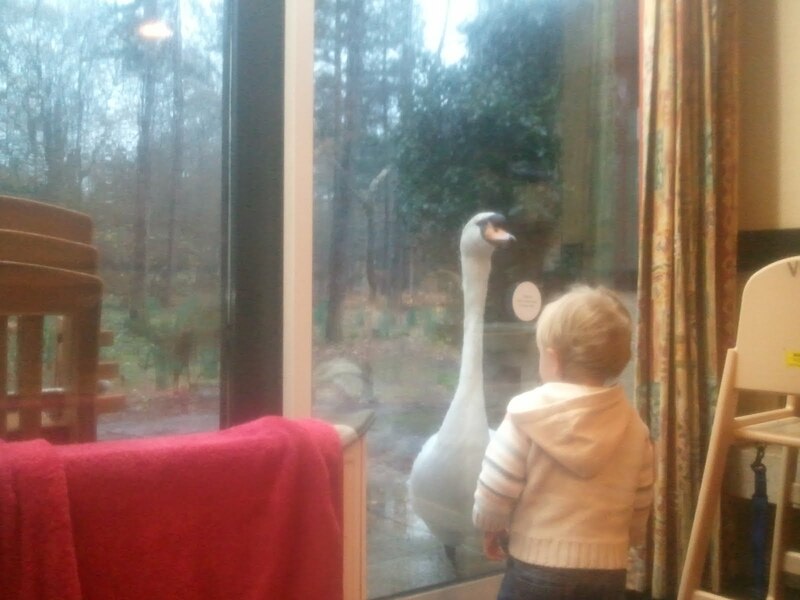 They didn't hiss, as we were told they'd become too domesticated and they only do it under attack. All I can say is thank goodness, they were revolting enough as it was. Funnily enough, none of the children or parents wanted to hold them. Then came 'Rosie' the Tarantula, who also didn't get a hold. I did however learn that if you drop a tarantula on it's abdomen, it will pop like a light bulb. Thanks for that, animal experts, excuse me while I throw up. After that was a bearded dragon, a boa constrictor, and a tortoise. Much better. Sam loved it ALL and wanted to touch everything they brought around! One of Ethan's favourite things was the child sized trolleys in the little shop, too cute! 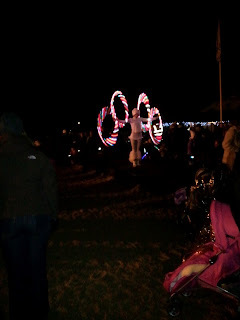 We went to a gorgeous fireworks display, where there were also some jugglers and 2 dancers, who were doing hula hoops, 4 at a time. Ethan thought it was very cool so he and Rich went to look closer. The dancers were wearing very small skirts over shorts (I guess to not impede the hoops) with tights and fluffy boots, and the girl did a spin while spinning these hoops (I'm not explaining this well!) and turned her back to Ethan who promptly said "Daddy! I can see her bottom!" Santa then did a pass of the beach on a speedboat, which Ethan loved, and then came round again. We'd already put him back in the pushchair to head home, and so we started getting him out to see over the crowd. He started shouting "Daddy! make Santa wait! I want to see him!" 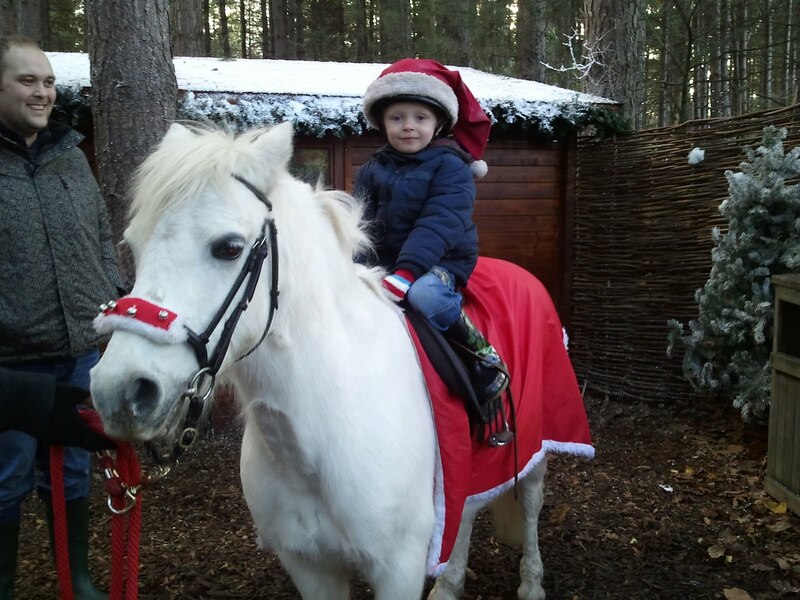 we got him out in time and he said "don't forget to come to my house Santa!" and blew him kisses. Bless him! All in all, a wonderful week, we didn't want to come home at all!